GoGreen Campaign Ride on 03 Jan 10 - GGI-Group size: 4000+ Professionals, Increasing on day to day basis, Come & join us 2 serve Mother Nature. This time we were 19 GGI's on the Campaign ride out of which 7 new comers.. As usual, started from RIS junction @ 6:55am and reached cubbon park by 7:25am.. Following was the route followed. UB-City Gate - Kasturba Rd - MG Road - Brigade Road - Rajaram Mohan Roy Rd - Gen Thimmaiah Rd - Subbaia Circle - Lalbagh Main Gate - Lalbagh Rare Gate - Ashoka Pillar - Swiming Pool road - Jaynagar 4th block - KFC - Jaynagar 5th Blk Cofee day/ Apple Mac show room. 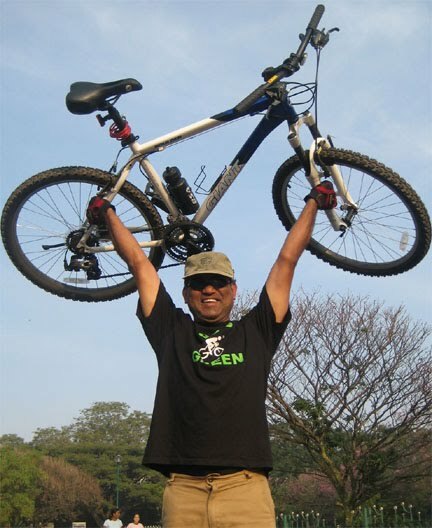 Vasant Kumar with his new GIANT Cycle doing a traditional bike salute..
Go Green Campaign Ride 03 Dec 2010 snaps.